Be happy by sending this Birthday Fiesta Gift Hamper and CCD Voucher to your dear ones and see the joy it brings to their life. This Hamper will make an ideal Birthday Gift as it features CCD Voucher (worth Rs. 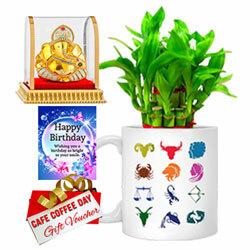 200), Sunsign Coffee Mug, Vignesh Idol, Bamboo Tree and Birthday Card.